Snubie.com: Small Batch #5 Kaffe (Coffee) - Review. 8 September 2018. Small Batch #5 Kaffe (Coffee) - Review. 8 September 2018. 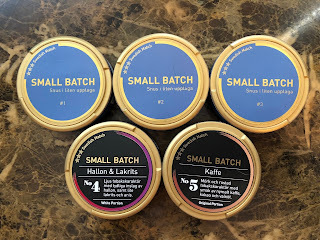 The final release in the Small Batch series from Swedish Match is here, and #5 has a taste of coffee! Small Batch 1, released in January, had a taste of champagne. Small Batch 2, released in February, had a taste of blood orange. Small Batch 3, released in May, had a taste of apple and mint. And lastly, Small Batch 4, released in July, had a taste of raspberry and licorice. All of those were white portions, but this one is different - it comes in the original portion format! The flavor description says, "Small Batch No 5 has a dark and roasted tobacco character with a taste of freshly ground coffee, cocoa and walnut. The roasted tones in the coffee complement the tobacco and provide a balanced taste. A nutty flavor with cocoa liqueur adds extra flavor. The original portion format fits the darkness of the product and makes the taste experience clearer." 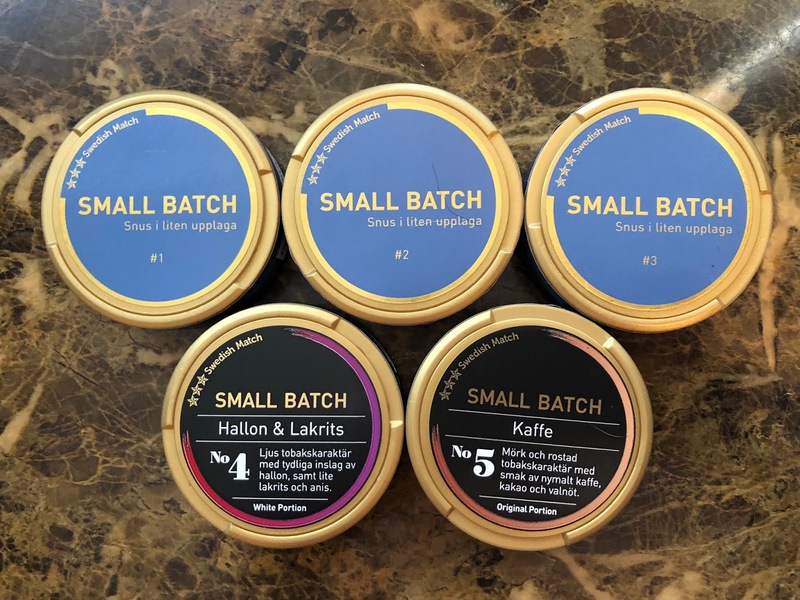 This snus comes in a 24 gram can with 24 portions for plump 1 gram portions! The nicotine content isn't listed, so I'm not sure what it is. The flavor of coffee isn't a common one on the market today. Kapten Mini Cafe Vit (AG Snus) and Olde Ving 99 (GN Tobacco) are the only two coffee flavored products currently produced. I will preface this review by saying I'm not a coffee drinker, but I was still interested to try this one out. When you open the can, the aroma is a dark, roasted coffee smell. There also seems to be a little chocolate and a little vanilla to it. The portions are plump one gram portions and are exceptionally moist! There is a quick release of flavor with this snus. The taste is a lot like the aroma. The coffee flavor is up front, and is dark and rich with a roasted quality to it. There is also a pretty present flavor of chocolate behind the coffee. Though it isn't listed in the flavor description, I swear I notice a light hint of vanilla in the background. There is a mild tobacco character in the background, which seems to remind me of the base tobacco in Göteborgs Prima Fint Lös. I like that this product isn't too overly sweet. I don't know what the nicotine strength is, but it feels to be in the regular strength to strong range. The flavor lasts up to about 45 minutes, which is the usual for most original portions. Though I'm not a fan of coffee flavored products, I did enjoy this snus. Now that all the Small Batch products have been released, what's next? I know on the Swedish Match webstore, you can rank these products, so perhaps the most popular one will be released as a full time product. That's what I'm hoping, at least, because I really enjoyed a few of these and would love to see them full time. Now that I've had them all, here's where I rank them. 1. SB #2 Blood Orange - My favorite of the series. This is easily one I would add to my full time rotation. The flavor was absolutely fantastic. 2. SB #4 Raspberry Licorice - It was hard to rank the top 2, but I gave Blood Orange the edge. However, I would also order this one and keep it my rotation. 3. SB #5 Kaffe - I'm not a coffee fan, but I could see myself ordering this one again. I enjoyed it. 4. SB #1 Champagne - This one was good, but not something I'd probably use a lot of. But, I'd probably get a can here and there. 5. SB #3 Apple Mint - I ranked this one last because there's already enough mint products on the market. There is also an apple mint product on the market made by Swedish Match.